Models will be dressed from head to foot in fashionable attire provided by It's All Good an upscale resale boutique located on Maine Street in Brunswick. Hair and make-up for the models is being done by Starz Hair Studio, also on Maine Street in Brunswick. The evening begins with a free wine tasting and silent auction featuring a wide variety of items, including Maine State Music Theater tickets, gift certificates, floral arrangements, wreaths and baskets of goodies for children and adults. Tickets are $20.00 per person and are available to purchase in advance at It's All Good, Starz Hair Salon or at the event. 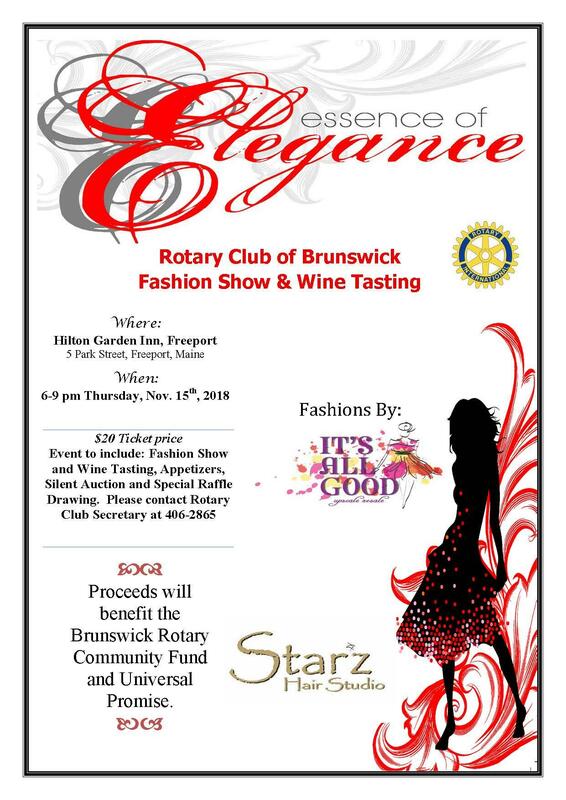 The money raised at the Essence of Elegance will benefit the Brunswick Rotary Community Fund, which sponsors events such as the annual Brunswick Bike Rodeo, the 4th of July Fun and Games on the Mall, the Pencil Box Project for Coffin School, Christmas gifts for all Brunswick and SAD 75 homeless children, along with Universal Promise, a water purification project for schools in South Africa. Please join us for an evening of excitement as the models walk the runway to benefit the Brunswick community and fresh water for school children in South Africa!